Motorbikes, A word humans usually associate with individuality, passion, enthusiasm, adrenaline, customization, fineness and above all liberation. Motorcyclists around the globe usually are people who may start up riding motorbikes as a part of mere necessity but the love of riding and joy of unstable stability is what appeals many to become motorcyclists for their entire lives. In Pakistan, most of our population rides affordable small engine globally obsolete variants of motorbikes for catering their needs. These motorbikes serve as family saloons for the lower middle class and we often see a family of 4 riding along. As the inflation rose a decade ago raising the value of the 4 wheeler, so came the influx of Chinese motorbikes thus enabling the affordability of two wheelers for the masses. As the world recovered from global financial crisis and Pakistan emerges from the stranglehold of terrorism, the prosperity in the past 5 years have risen altogether. With the prosperity flourishing the middleclass motorcyclist searches for a motorbike which not only serves the need but also fulfills the thrills of brisk acceleration and a comfortable ride, both of the aspects which couldn’t be associated with an affordable Chinese motorbike of obsolete design. 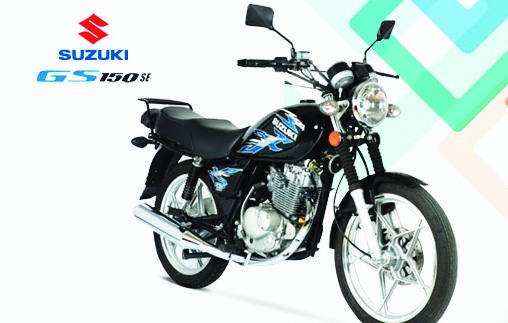 For this purpose enthusiasts turned to Suzuki Motorbikes and particularly towards Suzuki GS 150. A bike that is known to be the most comfortable & powerful, carbureted locally produced motorbike of recent times with a retro design.As the interest of the motorcyclists rose, the sale figures of GS 150 climbed as well. GS 150 is particularly known for its higher sprung weight which gives the rider comfort and high speed stability. The powerful engine displacing 150cc of Air/Fuel mix is also a masterpiece which propels the bike smoothly yet the acceleration doesn’t seem to stop even beyond 100kph thanks to the 5 speed sliding mesh gearbox. These are the reasons which have made the GS 150 a bike famous for long distance touring purpose. Humans are perfectionists.This means of having the very special ability of finding areas of improvement even with the perfect product. As more and more users acquainted with GS 150, areas of improvement were highlighted. Due to its heavier weight the need for a front disc brake was realized. Most of the users who bought GS 150 replaced its rear tire with a wider tire for better traction as well as in general opinion the standard factory tire was suited for obtaining better fuel economy but yielded lesser grip. Considering the user opinions, PSMCL has recently launched Suzuki GS 150 SE.Unlike most of the competing manufacturers in which a model change only means change of graphic stickers,this version now comes not only with stylish graphics but with front Disc Brake and wider rear tire as a standard. Alongside these updates we also get casted wheels, which add style while requirement of regular maintenance and alignment from spoke wheels is also eliminated. The motorbike features new front fenders and new shock absorbers as well. The shock absorbers have been upgraded to cope with the additional loading on the front fork due to addition of Disc Brakes. Published in Monthly AutoMark Magazine’s November-2016 printed edition.